1) Remove & clean impact residue/Paint Transfer from painted surfaces. 2) Restore plastic primer to panels & parts to promote adhesion between the plastic & the paint ensuring permanent repairs. 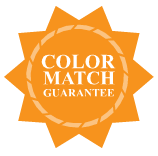 3) Restore color that has been removed using original factory O.E.M exact match paint. 4) Restore, shine & seal paint color using factory gloss clear to get long lasting permanent repairs. Stage 1: Your car is painted in layers from the factory so when your paint is scratched there are different levels of damage that occur in a single impact. Stage 1) light scratches where only the clear is damaged and needs the first 3 steps of this metallic repair manual to to either completely remove the scratch or camouflage it so it is barley noticeable. Definition: Clean-up is a product solvent solution that does a number of tasks when used within our car touch up paints scratch removal kits. Remove impact residue (whatever hit your car left its mark or smear behind). Clean up will only remove nitrocellulose or rubber residue along with road grime and other various types of industrial fall out. If the residue is enamel and can not be removed then blemish remover or quick cut polish will be required. Clean-up / solvent is a high grade paint thinner that is used to thin your factory exact match factory paint products & also is used for cleaning brushes, spills & other. Procedure: Always check in an inconspicuous area first to make sure the part being repaired is not refinished in nitrocellulose paints. Apply a generous amount of clean-up to the work cloth that is included free in the paint kit. Hold the moistened work cloth against the repair area for a short seconds where impact residue is visible. Proceed to massage the whole damaged area cleaning impact reside and other industrial fall out and blemishes. If the clean-up does not remove the impact marks use blemish remover or quick cut polish. 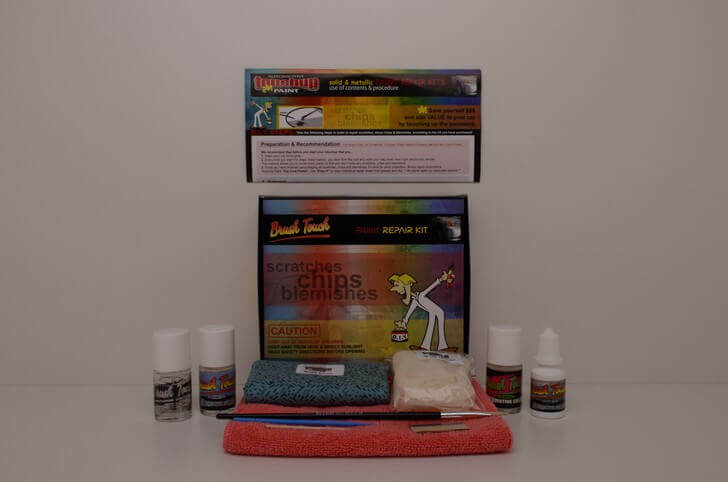 Clean Up Tips & Tricks: Clean Up is the first step in any touch up paint scratch or paint chip repair as it removes most residue transfer and prepares the repair area for next step in repairing scratches & stone chips. Clear Gloss Tips & Tricks: Brush Touch Clear gloss can be applied to metallic painted surfaces where the clear has started to peel off in spots. By sealing the peeling paint with brush touch clear you will possibly be able to slow or stop the peeling effect. Trick:As soon as a sign of peeling clear appears seal it with the Brush Touch clear to stop the peeling form travelling. Definition: Brush Touch Plastic Primer is used to promote adhesion between the plastic surface & applied top coat paints where the paints have been completely scratched by impact of foreign object. Failing to apply the plastic primer before painting will lead to a failed long term touch-up repair. Plastic Primer Tips & Tricks: Do not use plastic primer on metal surfaces. Always use in a well ventilated area and wear eye protection & gloves. Paint Color Tips & Tricks: Always know your paint layers and make sure your not touching up clear scratches with color or the scratch will look just as bad as the original scratch. Tips:You can usually tell which layer the scratch is in when using the Solvent or Clean-up solution. As the solvent is applied it will give the area a wet look. While it is wet if the scratch disappears that usually means that your paint scratch is confined to the top coat layer of the paint and Clear Gloss should be used.